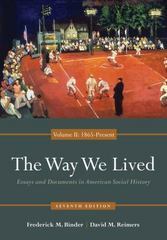 The Way We Lived 7 Edition This popular reader uses both primary and secondary sources to explore social history topics and sharpen your interpretive skills. Each chapter includes one secondary source essay and several related primary source documents. Chapter introductions tie the readings together and pose questions to consider.